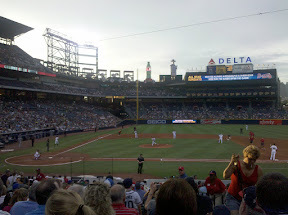 In my last post, I talked about our upcoming trip to Turner Field to watch the Braves. The only problem was that we didn't have tickets to WEDNESDAY night's game, we had tickets to THURSDAY night's game! Luckily, we discovered this before we left the hotel parking lot. When we arrived at the field, we parked in the GREEN LOT. It was a relatively short walk from the lot to the ballpark. There was an adventure before we got to the parking lot, but I'll regale readers with that story over on my personal blog (www.poppedinmyhead.com) later. We took a lot of pictures with my wife's camera! That's the good news. The bad? We left the USB/Media cable back in Arkansas. Yes, that was my fault. Well, fortunately, I had my Droid! This is the view from our seats. We were in Aisle 109, seats 101-104! 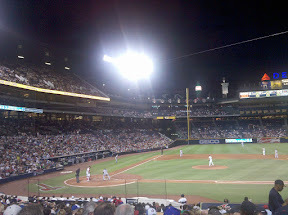 I cannot believe the incredible tickets we bought from the Braves website. Not only did we *not* have to deal with StubHub, but we ended up with a killer view of the game to boot. Naturally, the parking lot was on the opposite side of the park from our seats. We stopped for supper on our way to the seats. 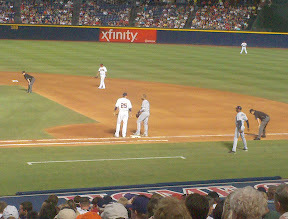 We arrived late (midway through 2nd inning), but the game had either been delayed or had a really long first inning because we had not missed much of anything given the time we finally made it to our seats. The Braves played the Rays tonight (er, last night for many readers). Did I mention we had GREAT seats!? I took most of these shots as the sun faded, hoping NightOwl would enjoy them. I have to say, except for the nose-bleed seats, there didn't seem to be a bad view from anywhere. Having watched the incredible Braves machine in the 90's and first half of the 2000's, it was disheartening to see how many empty seats there were. Of course, that's what led to our great seats, so I am not complaining too loudly! I pulled into the parking lot running on fumes in the gas tank, so after the game I waited in the parking lot until traffic seemed to actually move. Sure enough, we inched our way out of the lot and headed for the nearest gas station. Call me the big, bad boy, but it was a BP. I had to stop. Think of the family! We had a great time at the ballpark! Great shots! Great seats! Wish I was there. The footlong hotdogs at Turner Field trump Tropicana's any day of the week. I do miss those.